I Didn”t Know It Was Supposed to Snow?…Crash Has a Twin Brother! So I woke up early anyway and went to the gym. When I go outside there isn’t a drop of precip to be found. I was like …..Man I can’t believe it didn’t snow. So I mosey on to the gym, do my weight thing and go on the stationary bike to get the old heart a pumpin”. I put the Weather Channel on just to check the forecast. The radar comes up and it looks to me like the snow blew on through really early this morning. I was like: Oh man this is gonna be a great day……a blueberry pancake in January!!!! It was awesome. I guess all the Hobbits in us understand where I’m coming from with the whole breakfast(s) obsessions…I hope so anyway. So I get to the house around 9AM and start to set everything up. And it starts to snow. It’s just gonna be some flurries though…I mean the radar loop I saw on the Weather Channel showed zero precipitation from 6am on. What’s this stuff about? The boys are getting there around 10 so I really didn’t think much about the snow. Boy, it’s really startin’ to come down. I start working where I ended the other day. I just filled in the extra support legs for that back spandrel beam I put up last time. I mean the snow is really starting to come down now. I mean big time. Here’s a better picture of the support system. North east spandrel extension with leg supports in place. As I was finishing this up the boys showed up and I had to stop and show them what I needed them to do. So I had Jude, Terence, RJ, and Kevin there. It had sort of kind of sort of stopped snowing for the moment. It was weird. Did you guys hear it was supposed to snow? No. No. No. And RJ said: It’s not gonna snow! Even though we already had at least an inch on the ground! Huh? There were a bunch of little things I had the boys do to get started and then it really started coming down. So I figured I would set up Terence and RJ inside the Hobbit House and put them to work on the detail blocks. I had Jude and Kevin closing up the east wall and then wanted them to start putting the walers on. It wasn’t that cold out so it really wasn’t too bad working in the snow. The snow is really still coming down hard and steady. I mean, I was thinking: Is this some sort of sick Weather Channel joke, or what? Then my phone rings. It’s not the Weather Channel calling with an apology. It’s my wife….Ethan just got into a car accident in town. Town is less than 5 minutes down the road so I tell the boys what happened and off I go. Good thing I had the truck. The roads have about 3-4 inches of snow on them and the snow plow drivers are probably just getting called in. Good job Weather Channel! The roads are really bad. There’s a sheriff there when I arrive so all the mandatory exchanges are taking place. Just a little too quick around the turn and that’s all it took. Thank the Lord nobody got hurt. 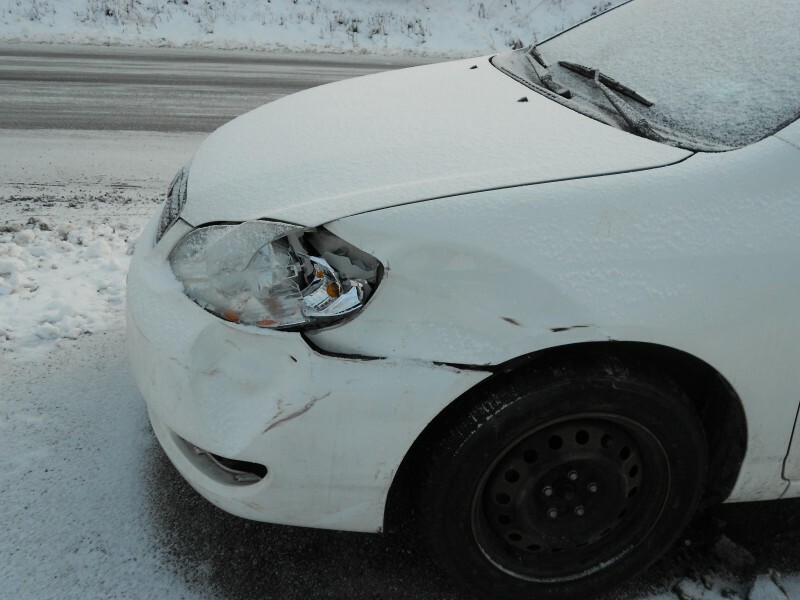 The other persons car had just a bit of damage to the rear tire and back quarter panel. Ethan’s car wasn’t so lucky. Check it out. Ethan’s, aka “Big Crash” , now undriveable car. Now we have two sons to call Crash. Ethan is Big Crash and Jude is Little Crash. Terence will probably be next in a few years. We’ll have to call him Baby Crash. Watch, I’ll be the next one to crash. They’ll call me…..Boy that’s a tough one. I’m gonna have to think about that one. It might even be unprintable being this a family friendly blog and all. After the crash we dropped the car off and I drove the truck back to the house. I had the boys wrap things up and we called it a day. Kevin has an all wheel drive vehicle and his home’s not far. I drove RJ’s car back to his house and Jude followed behind in the truck. The roads were not good. So it was a bit of a bust here at Hobbit Hollow this weekend. I did take a few pictures of a couple of things I had mentioned last week though. Here they are. Fully formed bracing system for the plywood templates. Where the plywood seams meet I did the bracing detail. 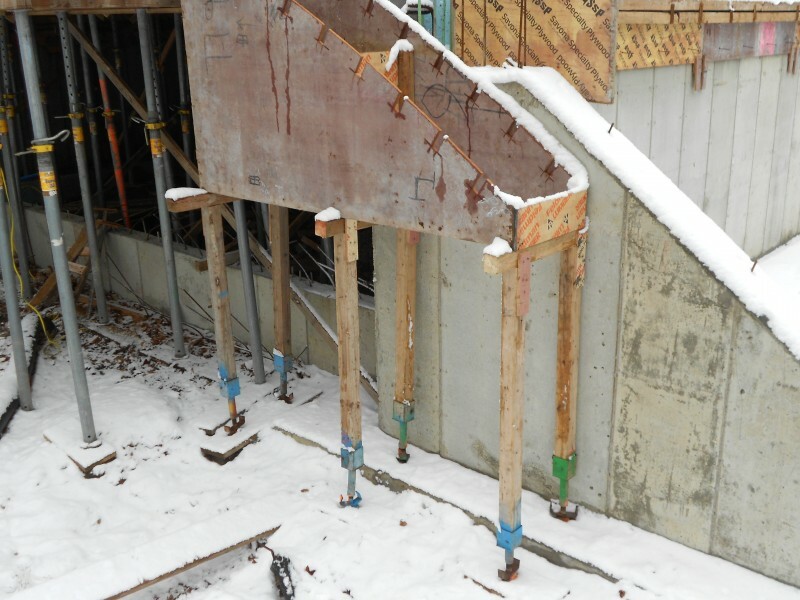 I had originally braced the ply with a 3×4 at the joint and a 1×4 brace. I added another 3×4 across the other side braced the top with solid 3×4 blocking and secured the bottom of the 3x4s with plywood cleats. I added another 1×4 X-brace to finish it off. 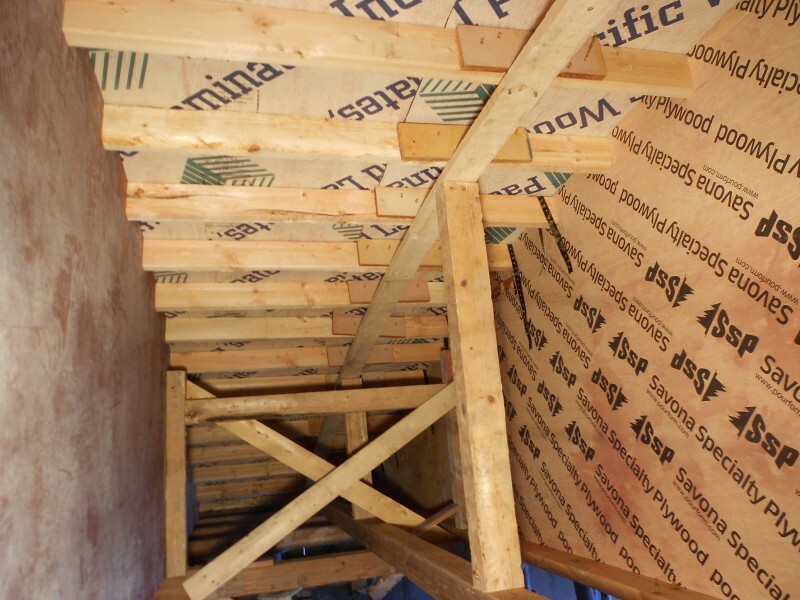 This is the continual bracing system we put in place for the whole house at the three joint locations. The next picture shows what we are going to do where the 2x4s are spliced to support the roof. Check it out. 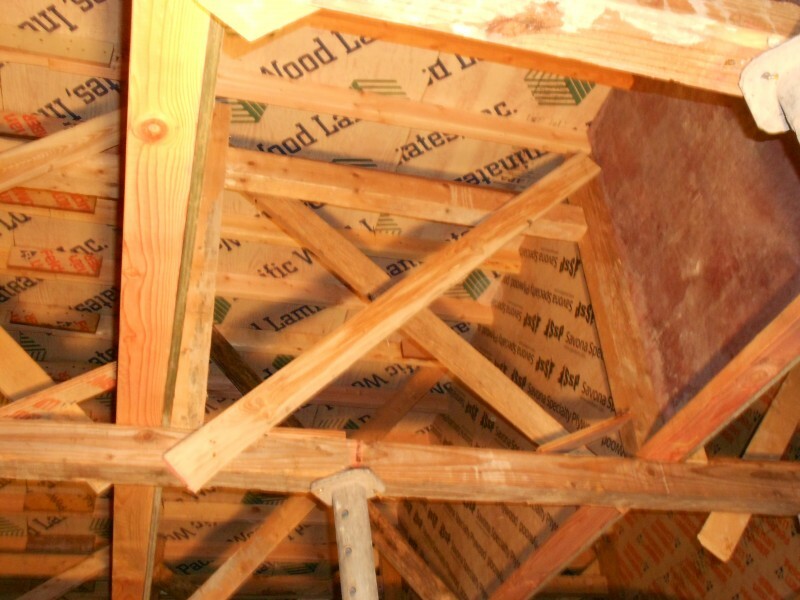 Additional support is needed at 2×4 joint in roof structure. So before I did the roof framing I laid out a 4×4 stringer which spans the other stingers at 90 degrees. That is our support system for this critical joint in the framing. So where we spliced the 2x4s with cleats we held a 1×4 up to the joint and supported it with 3x4s which were cut to fit. These rest on that stringer I had just mentioned as shown in the picture. We have to add additional supports but hopefully you get the picture of what we’re doing here. I used 12 foot 2x4s for the roof support. I think if I used 16 footers I could have eliminated one of these joints. I was thinking it would be a little more manageable to use 12 footers. This will be a good job for the boys once they get the hang of what they are doing. I don’t know if it’s me or what but this winter seems to be moving right along. Thank goodness.Must be the Hobbit in me. Or maybe it’s the thought of another blueberry pancake next Saturday. Actually my wife picked up some strawberrys today. We’ll have to check them out as well. Where the heck are they growing this fruit? Enjoy your week and be wary of the forecast! Daddy Crash? Naa. I’ll have to let my boys come up with something. Talk to you soon! PS: So I go upstairs to talk to Big crash…He’s leaving for college in a few minutes and I start telling him about this post. Of course they all came up with some good names in the blink of an eye. Here are just a few: CrashMaster, Crash Boss, the NecroCrasher, Father Crash. A Polar Vortex?….Oh Yeah, and Make Sure You get rid of That Pumpkin. A Quick Update….So Much For The Wooly Bears…Oh Yeah and I Found Out What Hell is Like!